As February is our traditional cruise shipping edition, naturally we’ve selected a fishing boat and two crabs for the cover. But as many of you may already know, that’s not just any fishing boat, rather it is the Cornelia Marie, its owner Josh Harris and captain Casey McManus, stars on the hit cable television show ‘Deadliest Catch’ which provides an up close and personal look at the rigors of catching crab in the Alaskan Bering Sea. 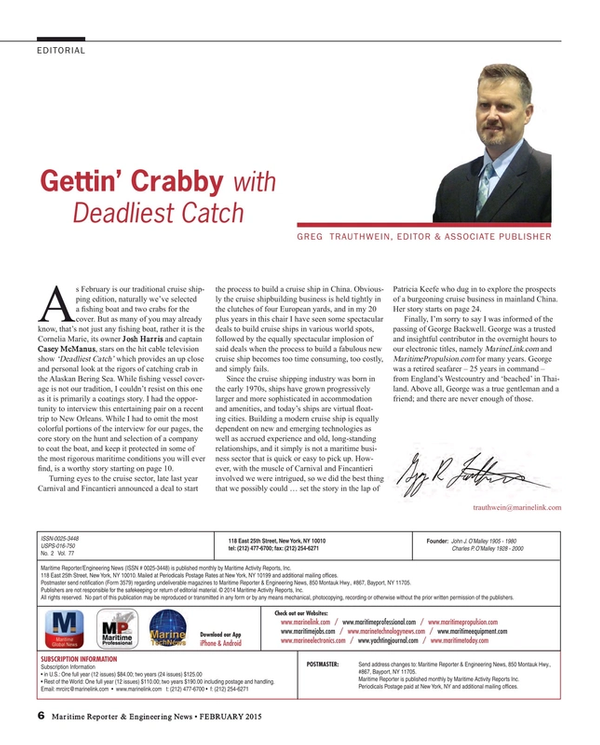 While fishing vessel coverage is not our tradition, I couldn’t resist on this one as it is primarily a coatings story. I had the opportunity to interview this entertaining pair on a recent trip to New Orleans. While I had to omit the most colorful portions of the interview for our pages, the core story on the hunt and selection of a company to coat the boat, and keep it protected in some of the most rigorous maritime conditions you will ever find, is a worthy story starting on page 10. Turning eyes to the cruise sector, late last year Carnival and Fincantieri announced a deal to start the process to build a cruise ship in China. Obviously the cruise shipbuilding business is held tightly in the clutches of four European yards, and in my 20 plus years in this chair I have seen some spectacular deals to build cruise ships in various world spots, followed by the equally spectacular implosion of said deals when the process to build a fabulous new cruise ship becomes too time consuming, too costly, and simply fails. Since the cruise shipping industry was born in the early 1970s, ships have grown progressively larger and more sophisticated in accommodation and amenities, and today’s ships are virtual floating cities. Building a modern cruise ship is equally dependent on new and emerging technologies as well as accrued experience and old, long-standing relationships, and it simply is not a maritime business sector that is quick or easy to pick up. However, with the muscle of Carnival and Fincantieri involved we were intrigued, so we did the best thing that we possibly could … set the story in the lap of Patricia Keefe who dug in to explore the prospects of a burgeoning cruise business in mainland China. Her story starts on page 24. Finally, I’m sorry to say I was informed of the passing of George Backwell. George was a trusted and insightful contributor in the overnight hours to our electronic titles, namely MarineLink.com and MaritimePropulsion.com for many years. George was a retired seafarer – 25 years in command – from England’s Westcountry and ‘beached’ in Thailand. Above all, George was a true gentleman and a friend; and there are never enough of those.